There are three different versions of this story. Only one of them—or none of them—can be true. 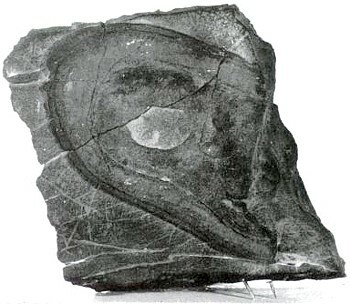 Before 1917 an engineer and amateur geologist, John T Reid, is said to have found a fossil in the Triassic limestone of Fisher Canyon, Pershing County (Nevada, USA). Reid was active in Nevada between 1898 and the 1920s and excavated the controversial Lovelock Cave in 1912; his collected papers are kept by the Nevada Historical Society. On 25 January 1927 John T Read or Raid made the discovery. In ‘1927’, Alfred E Knapp made the same discovery. As the find was first reported by W H Ballou in the New York Sunday American of 8 October 1922, the versions with a 1927 date can immediately be discounted. Even so, as we shall see, this does not mean that the version of the story attributing the find to John T Reid ‘before 1917’ is correct, though. The stratum in which the fossil is usually said to have been found is conventionally dated to 225 million years ago (although some give a date of 5 million years or state that it was from coal layers 15 million years old). However, the accounts also state that it was found lying among a pile of loose rocks, fossil side uppermost, on the side of a low hill. It showed a shoe print, complete with a broken off heel (Knapp is quoted as saying that “it is a layer from the heel of a shoe which had been pulled up from the balance of the heel by suction, the rock being in a plastic state at the time”). Microscopic photography carried out later at the Rockefeller Institute (or Foundation, according to the variant account) supposedly confirmed that it was indeed a heel and that the fossil seemed to show the presence of two rows of crewel, 8.5 mm (⅓″) apart, with the twists in the thread clearly visible. Minute crystals of mercury sulphide confirmed the fossil’s antiquity. According to Samuel Hubbard of the Museum of Archaeology in Oakland, California, “Today’s people on the earth are not yet able to make this kind of shoe. Facing this kind of evidence indicates that at the time of suspected uncivilized arthropods, millions of years ago, people with high intelligence appear to have existed…”. The version according to which the fossil was discovered by Raid quotes him as saying that “the minutest detail of thread twist and warp, proving that the shoe sole… is strictly the handiwork of man”. It is also claimed that the right side appeared more worn than the left, indicating that it was a shoe worn on the right foot. Even supporters of the fossil admit that most geologists who have examined the rock have concluded that it is a natural formation, even though it closely resembles a shoe print. Its present whereabouts do not seem to be known, so there are no recent assessments of the stone. However, the problems are even greater. Why are there two separate accounts of the same discovery, made at different dates and by different people? Why is there no agreement about the date and character of the rock in which it was found? What about the expert opinion of Samuel Hubbard? He is quoted elsewhere on this site as giving an opinion on an alleged Tyrannosaurus pictogram from Arizona. Although on that occasion, he worked as Curator of Archaeology for the Museum of Natural History in Oakland, California (USA), this time, he works for the Museum of Archaeology. He is also quoted in 1923 as an authority for the genuineness of the Lady of the Woods in Crater National Park, saying that it might be the cast of a woman engulfed by a flow of mud that had poured down the side of Mount Mazama. The fact that The Lady of the Woods was carved in 1917 by Dr Earl Russell Bush (and publicly acknowledged as such in 1921) does not inspire confidence in Hubbard’s investigative abilities. Moreover, another quote from him about this discovery rather gives the game away: “There are whole races of primitive men on Earth today, utterly incapable of … sewing that moccasin. What becomes of the Darwinian Theory in the face of this evidence that there were intelligent men on Earth millions of years before APES are supposed to have evolved?” This makes it clear that Hubbard was not a dispassionate investigator, but one on the side of the creationists at a time when the debate in the USA was at its fiercest. Given the inconsistencies in the story, it is difficult to take seriously any of the claims being made for the ‘fossil’; indeed, there is little evidence that it is indeed a ‘fossil’ rather than a product of erosion on a concretion. It is also troubling that there are two incompatible versions of the story, both complete with circumstantial details; one or the other has to be false, if not both. A solution to the dual discovery can be found in Samuel Hubbard’s Discoveries Relating to Prehistoric Man by the Doheny Scientific Expedition in the Hava Supai Canyon, published by the Oakland Museum of Natural History in 1925, where he states that John Reid sent him the photograph of a footprint discovered by Alfred Knapp. Hubbard is the source of the statement that it was examined by the Rockefeller Foundation, but he merely says that the Foundation confirmed the rock as Triassic sandstone. It is Hubbard who says that “micro-photographs were made which showed very clearly that it bore a minute resemblance to a well-made piece of leather, stitched by hand, and at one time worn by a human foot. The photographs showed the stitches very plainly…”. The later, secondary sources have muddled the information in Hubbard’s publication, which is the primary source for the story, even though Ballou’s account is earlier. In other words, the discovery was made by Alfred E Knapp at a date some time before 1917. It was brought to public attention by John T Reid, a mining engineer (1871-1943). Any publication or website that gets either of these details wrong is not to be trusted: the author has not done any research into the object but is merely repeating what others have written. is this print mentioned in the hab theory novel by allen w. Eckert pp.298? Reminds me of “these rocks could only have been cut by lasers” the ancient alien guys like to tout. That’s the so-called proof that this is “bad archaeology”? “Even supporters of the fossil admit that most geologists who have examined the rock have concluded that it is a natural formation, even though it closely resembles a shoe print.”, and, “Why are there two separate accounts of the same discovery”? At best, you should have this as “Status: Suspect”. Let’s keep looking, and let’s keep our minds open. Today’s theories are not infallible. Yea, let’s not keep it so wide open that any piece of trash gets tossed in.